BRACEBRIDGE, ON – Muskoka Cottage Brewery has announced the upcoming release of a new beer, Muskoka Light Pilsner, as well as a new mixed-pack featuring their entire line-up. Brewery rep Mike Laba tells the Great Canadian Pubs and Beer blog that Light Pilsner is “clean, refreshing, and flavourful for a lower alcohol (4%) pilsner”. In addition, unlike many mainstream light beers that are brewed to a higher alcohol and watered down, 4% is the original gravity of the Light Pilsner. 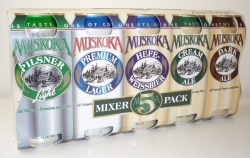 To help launch the beer, the brewery will be releasing a Muskoka Mixer 5 Pack featuring 473 ml cans of Muskoka Premium Lager, Hefe-Weissbier, Cream Ale, Dark Ale and Light Pilsner. The package will be available soon at LCBO outlets for $12.45. I have always have better dance moves than mike laba.